Before I go discuss the specifications and sound in more depth, lets take a look at the box and its contents. The Oppo packaging is top notch. Everything is neatly organised in the box which includes the Oppo HA-2 itself, a 2 pin VOCC charger, a short lightning cable, a OTG micro USB to micro USB cable, a 3.5mm to 3.5mm cable, 2 rubber bands for securing it to another device and detailed instructions. 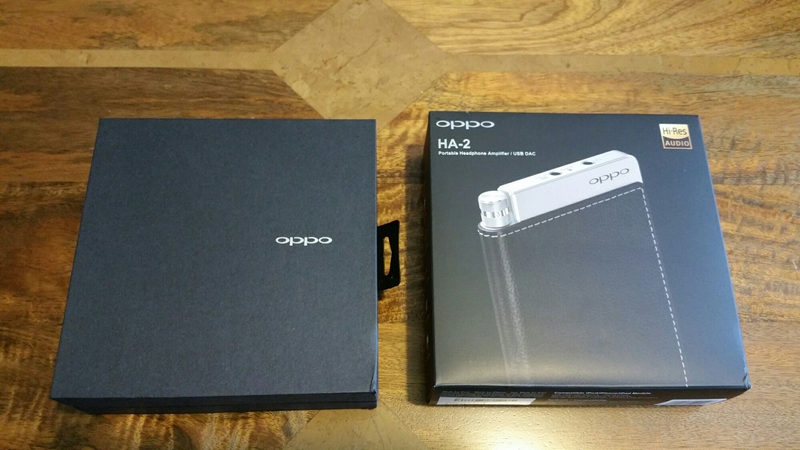 The Oppo HA-2 simply stands out as a solid, well built and gorgeous looking device (see photos). It does not need a case as it is bound in leather. Ok, so what makes the device really special. The Oppo HA-2 is a Hybrid Class AB Amplifier with integrated circuits and discrete transistors. Oppo uses hand-picked and matched parts for the discrete transistors. The output transistors are biased to operate in their most linear range for the critical small signal, and deliver their full potential when power is required. This was most noticeable for when I was listening to music that scaled up suddenly. The Oppo HA-2 is “MFI” Apple certified and is compatible with the latest iPod, iPhones and iPads, meaning it can be use the digital audio output via the supplied lightning cable. The HA-2 does not need the Camera Connection Kit. 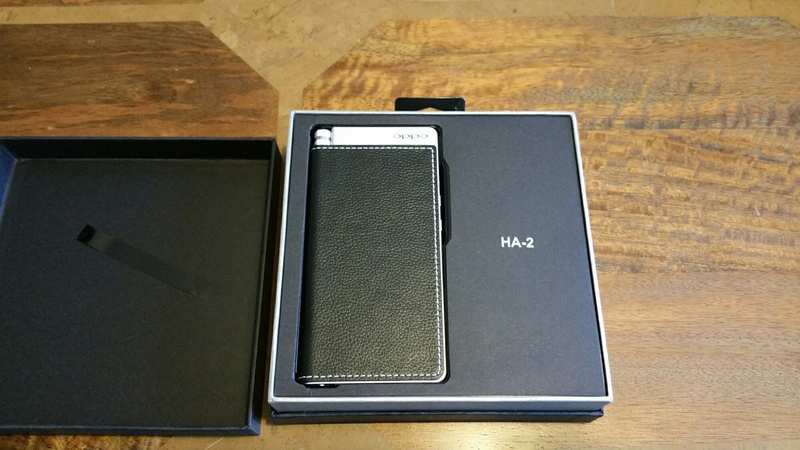 I tested the HA-2 with an iPhone 5S and 6 Plus and the iPad Air and all worked as advertised. Android – The HA-2’s micro-USB input port works with Android devices that support USB OTG (USB On-The-Go) and USB Audio Class. A special USB OTG cable is supplied with the HA-2 to facilitate the connection. When used with a compatible Android device, the HA-2 can support the device’s built-in music app, tones and notifications. Additionally, a high-resolution music playback app can use the HA-2 as its external DAC to play lossless PCM and DSD audio files eg USB Audio Player Pro app for android. Audio-In and Line-Out – The HA-2 has a 3.5 mm Audio-In port to support portable music players that do not have a USB-compatible digital output. While the HA-2 is used with one of its USB digital input ports, the 3.5 mm jack acts as Line-Out for the USB DAC. And now on to the crown jewels of this device. ESS Sabre32 Reference DAC – The DAC is one of the most important components for digital audio playback. The ES9018-K2M DAC chip used in the HA-2 is the mobile version of the ES9018S. 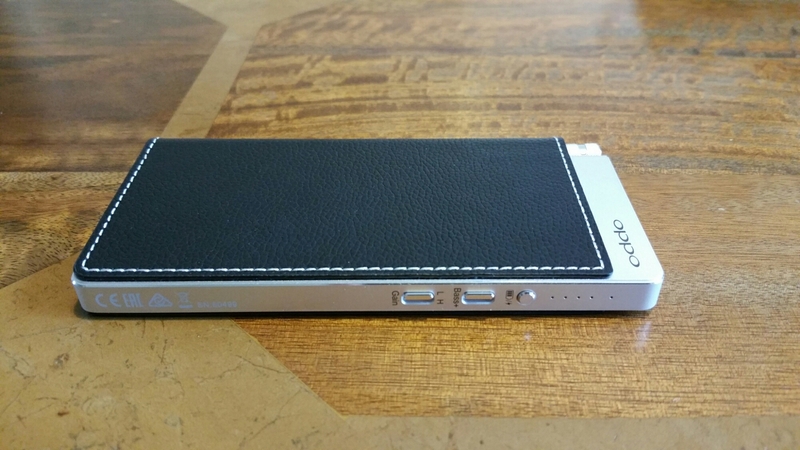 Oppo use this DAC in their award-winning HA-1 desktop headphone amplifier which costs £1,100. With the ESS patented 32-bit Hyperstream™ DAC architecture and Time Domain Jitter Eliminator, the SABRE32 Reference DAC delivers an unprecedented performance for mobile applications. The performance and quality of this DAC is outstanding. Asynchronous USB DAC – The HA-2 can bypass the smartphone’s built-in DAC and headphone amplification circuit that are often cost-constrained. The asynchronous USB DAC input of the HA-2 also works with PC and Mac computers to replace the built-in sound card and support high-resolution audio playback with PCM up to 384 kHz 24-bit and DSD up to 12 MHz (DSD256). Clean Signal Path – There is no DSP (Digital Signal Processor) in the HA-2. Volume control is operated by a combination of the DAC chip’s internal digital volume control and an analog potentiometer (the volume knob). Bass boost is performed by pure analog audio circuits. By avoiding re-digitising the audio signal for volume adjustment or bass boost, the HA-2 provides a clean signal path for the audio. And the difference is noticeable in playback. Bass Boost – HA-2 offers a Bass Boost function. With Bass Boost off, the HA-2 delivers a ruler-flat frequency response; with Bass Boost on, the HA-2 adds force and impact to the sub-bass region without muddling the important mid- to high-frequency bands. In reality, I found I didn’t need the bass boost, although I can’t deny it wasn’t fun to use at times. Two Gain Settings – The HA-2 offers two gain level settings for optimal headphone matching. The High Gain mode is capable of driving large power-hungry headphones, delivering up to 300 mW into 16-Ohm headphones. The Low Gain mode is intended for sensitive In-Ear Monitor type earphones. Rapid Charging – The HA-2 features patented VOOC rapid charging technology from OPPO. Using the supplied rapid charger, the internal battery can be quickly and safely charged to 75% capacity in about 30 minutes. It only takes approximately 90 minutes to fully charge the battery. A quick charge gives the HA-2 hours of operation time. 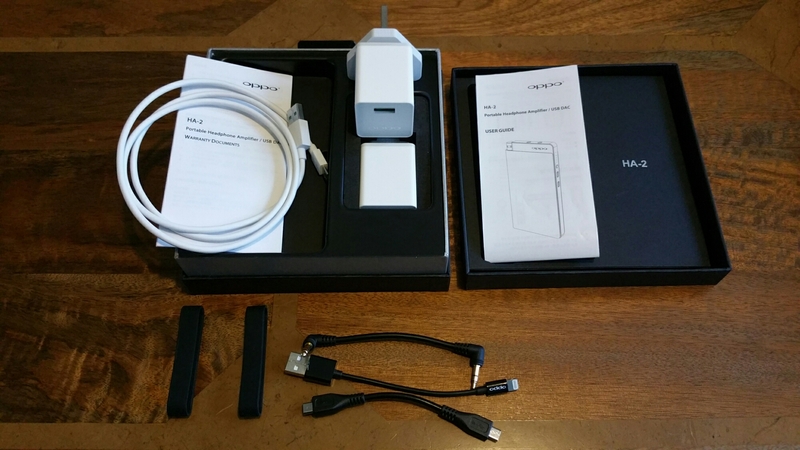 The box came with a 2 pin adapter, but also included was a UK VOOC charger. 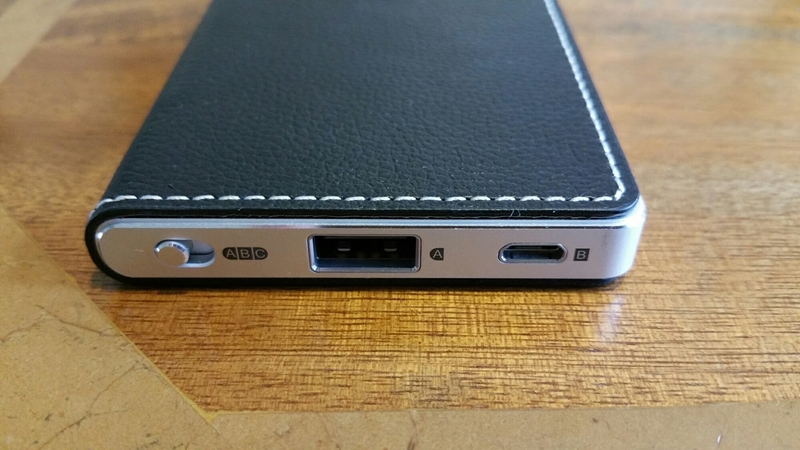 Mobile Power Bank – The HA-2 functions as an external battery pack to charge your mobile device. – Digital: USB A for iPod / iPhone / iPad; USB micro-B for smartphones with USB OTG feature and computers. 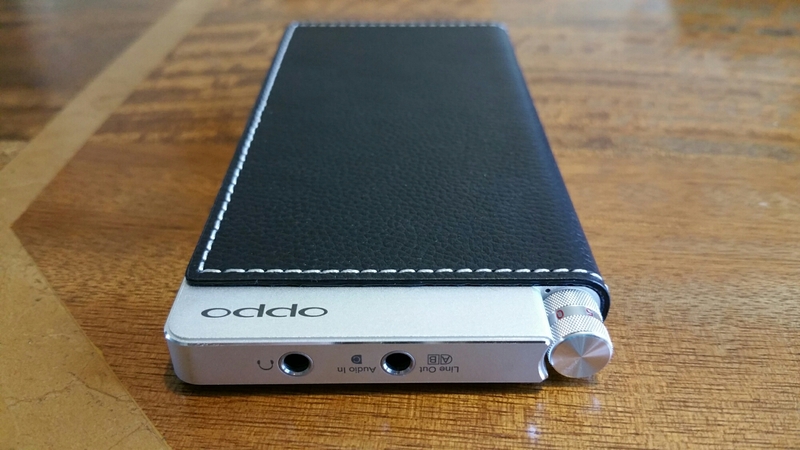 So what really matters ultimately is how does the Oppo HA-2 sound. For this test I used the following headphones: AKG K845 (wired), Sennheiser HD518 and V-Moda Crossfade M100. Genres used – Jazz, Blues, Pop, Rock, Female Vocal. FLAC recordings via Tidal and 320mp3 bitrate songs otherwise. Below are a selection of the songs I have listened to via the HA-2 using iPad Air, iPhone and Samsung Note 4. Sally Barker – To Love Somebody/Dear Darlin – With all 3 headphones the vocals, guitar and the extra detail extracted by the HA-2 was superb. Sally Barker’s voice sounded so delicate and emotional. I preferred the sound from my HD518, then AKG K845 and lastly V-Moda Crossfade M100. The HA-2 did wonders with the HD518 creating a sound from them that I haven’t witnessed before. Adele – Rumour Has It/ Lovesong – vocals, drums, instruments and the beat – all so well captured and played. The musicality of the HA-2 was present in abundance. The HD518 excelled again. The V-Moda had tons of kick too. The HA-2 pushed deep bass into the AKG K845 which was pleasing. Paloma Faith – Can’t Rely on You – punchy, musical and a superb presentation. Plenty of bass but not overkill. The bass boost is nuts and so powerful in the sub bass, I have to turn the volume down. Yolanda B Cool & D Cup – We No Speak Americano – even without the bass boost, the AKG K845 were being supplied bass at perfect levels. Of course, I had to flip the bass boost mode too, and bass freaks will love it in this mode. Again, a detailed musical presentation. Vocals are so good. The V-Moda M100 with bass boost on were awesome with a tight in control beat. The Louis Lester Band – Downtown Uptempo/ Sweet Mary Jane – such great musicality, beat, bass, vocals, wide soundstage, instruments clearly placed in different positions. If you get this device, you must listen to Sweet Mary Jane – you will be blown away at just how good this track sounds across all headphones. Queen – Bohemian Rhapsody – what’s not to like. Superb presentation again. Bastille – Weapon/ the Driver – the electronic sounds and fast beat really well delivered. Great vocals again. Nicola Benedetti – The Lark Ascending – mesmerising delivery. Frighteningly amazing. Brought my hairs up on my arms. The music scales up as the drama unfolded too. What I did find with all the headphones used is the HA-2 was better in high gain mode. Low gain worked better with IEM’s. Also, you will be cranking the volume knob of the HA-2 up to near full or one or two steps before it. 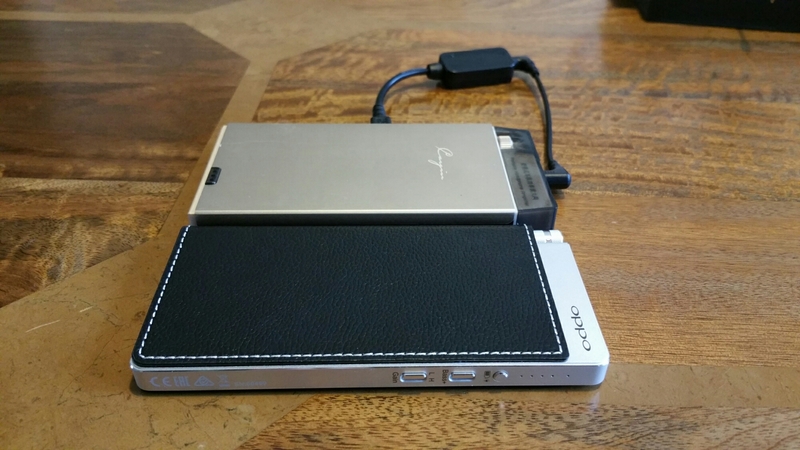 I have shown the Cayin C5 which costs £110 vs the Oppo HA-2 at £259. The Cayin C5 is just a headphone amp without a DAC, so in my current setup I used the HiFiMeDIY Sabre Android USB DAC which costs £27. Links to Cayin C5 Review click here and HiFiMeDIY Sabre Android USB DAC review click here . The HiFiMeDIY uses a Sabre ES9023 DAC which is a decent DAC and hence value for money is incredible. In terms of the Cayin C5 amp this delivers an astounding 800mw at 32ohms, whereas the Oppo HA-2 delivers 220mW at 32ohms. So the Cayin C5 is capable of delivering oodles of power. However, it just does not sound as good as the HA-2. So it we adds the cost of my previous setup, that totals £137 vs £259 for the HA-2. Do you get twice the increase in quality. No. More like 30% and in a single classy looking unit, with fast charging which means it takes 1 hours 30 mins to fully recharge vs 4 hours with the Cayin C5. So Oppo have really delivered with the HA-2 and on a number of fronts. Due to the components used inside, these will sound better after 100 or so hours. I will do another post, once I have reached above this point to update you on any of my findings. Pingback: Mike Manning Audio | Brilliant Review of The Oppo HA-2 by Gavin’s Gadgets! does oppo HA2 will be any beneficial for improving sound quality of iems , or this is strictly for power hungry headphones ? The HA2 is a high quality combo with fast charging and not just for power hungry cans. If you got the C5 this would give you more “power” . The Ha2 gives better quality . No one is shiiping Oppo HA2 internationally . I stay in India. Theres shipping of Cayins new C5DAC and C5 amp . Have u heard cayins new C5DAC ? Not heard the C5 DAC yet. GREAT review Gavin! I appreciate the detailed review and specific info given on the HA-2. Seems like a great device! Thanks Steve. It is a fab device, using right now as I type this! Haha, great timing then! I ordered it and it’s coming in today. Gonna test it out vs the pricier Celsus Sound Companion One http://www.celsus-sound.com/index.php/product/companion-one , which for the most part is rated better (though double the price), to see if I notice a difference. If not, I will return the Companion One and keep the HA-2. We’ll see. Ok sounds good! I look forward to it! Ok finally got it done. Take a look at link below. Superb review 🙂 I left a comment as well. Thanks Gavin! Glad you liked it!